Quite often our blog subjects come from recent conversations had with customers in the store. In recent weeks there have been several mentions of Screech Owl sightings. So the diminutive Screech Owl will be the subject this week. The Eastern Screech-Owl is a small owl, about 8.5" in length (height), with feathered ear-tufts. Its wingspan is about 20” and weighs in at only about 6 oz. The eyes are yellow, and the bill is greenish. Male and female plumage is similar. As is the case with most birds of prey the female is larger, but the male's voice is lower-pitched. Its song is a distinctive trill and descending whinny that does not sound like the typical hooting of its bigger relatives, the Barred and Great Horned owls. To hear the call you can go to the Tennessee Watchable Wildlife website, or to the Cornell Lab of Ornithology website allaboutbirds.org. The Screech owl has two color-morphs, reddish-brown and gray. In Tennessee the red morph outnumbers the gray by almost two to one. No other North American owl has such distinctive plumage differences. It is found in urban as well as rural areas and readily nests in nest boxes. We don’t sell a lot of Screech owl boxes per year but several customers have had success attracting them. Like most owls, it is more often heard than seen. This small owl will feed on insects, earthworms, rodents, and even crayfish and songbirds. The nesting phase of Screech owls begins in March with peak egg laying late March to early April. Clutch sizes are usually 3 to 4 eggs but may be as many 6. Nests are usually in cavities that are either natural, excavated by a woodpecker, or human-made nest boxes, including Wood Duck boxes. They add no nesting material to the nest cavity. The female does most of the incubating which lasts about 26 days. It then takes around 30 days, give or take a few, for the fledglings to leave the nest and then remain dependent on the parents for up to 3 months. Screech Owl nesting box availible at the shop. There is still plenty of time to put up a Screech owl box and attract them this spring. We have boxes in the store for $69 and through January 27 they will be 20% off. We do not keep a lot of these boxes in stock so if you come in during the sale-period to purchase one and we have run out we will order one for you and honor the sale price. 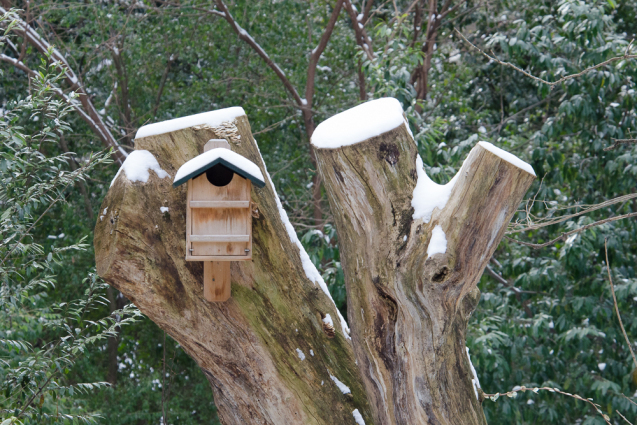 Nest boxes should be placed at least 10 feet up on a tree or 4x4 post, on the edge of woods, fields or wetlands. Mount on a post with a predator guard to discourage squirrel activity. And here’s an interesting link to follow to see where you might be able to better your chances of locating and seeing a Screech owl. Click here for E-Birds Screech Owl list.